Change the way you look at the world! Witness stunning sunsets and endless ocean views from the unique perspective of Diamante Del Sol and your amazing balconies. The wide open volcanic sand beaches and lush rainforest surrounding Jaco provide everything you need. 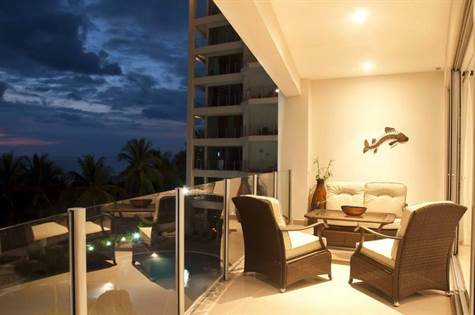 This immaculate complex sits right on the beach and is within walking distance of downtown Jaco where you can browse the local shops, taste the delicious local cuisine, or check out some of the best nightlife spots in Costa Rica. Spend your days lounging on the beach under the palm trees, swim in the extra large pool area, relax on your wrap around balcony and soak up the sun and panoramic views. This sprawling 2,265 sq foot, 3 bedroom, 3.5 bathroom condo comes fully furnished with all of the amenities and comfort of home. Floor to ceiling windows with unobstructed ocean views, and wrap around balcony that faces the ocean and sunset. Huge open living area with comfy leather couches for lounging, flat screen TV with full cable, and glass doors leading out to your private balcony. Fully equipped modern kitchen with top of the line stainless steel appliances, ice maker in the fridge, granite counter tops and large breakfast bar. Dining room area that is perfect for entertaining sunset dinners and watching the waves roll in. Every bedroom is equipped with its own in suite bathroom and private balcony. The master bedroom has a flat screen TV, safe, and glass doors that lead out to the main balcony. The second bedroom has a queen size bed, its own private balcony, and the third bedroom has double beds, and private balcony, with plenty of room for friends and family. The unit has its own laundry room with full size washer and dryer. THIS IS A GREAT INCOME PRODUCING INVESTMENT OPPORTUNITY!